I’ve known Rabbi Levi Deitsch for over 15 years, first as merely co-summer camp mates but later as a colleague and friend. I always knew Levi as a cheerful, friendly and exciting fellow. Always with a smile, kind word or both, Levi was the ultimate people’s person. 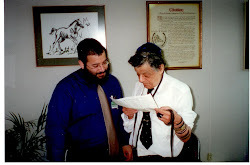 In 2002, Levi moved to my home state of Virginia to start up a Chabad House in the Tysons Corner area. I was honored that Levi was moving to my state. After the move, I spoke with Levi from time-to-time about many different subjects from Chabad House happenings to how to run a certain event and even just random small talk. Living in Virginia then, I was anxious to make my way north to visit. I saw him there several times, and even spent the night with he and his wife as my hosts. Levi and Miriam's legendary hospitality was nothing short that night. My friend, who was not observant, and I felt more than welcome and as comfortable as at home. Not to mention that it was three days before Chanukah and it’s not like they had nothing else to do. That was 2005. In 2006, Levi lost his father, Zalman, a young man whose passing was sudden and tragic. I was out of the country and tried fruitlessly to reach Levi to offer condolences. The connection was never made. A week later, unimaginably, Levi’s uncle (Zalman’s brother) Yaisef passed. Now back in the country, I paid a Shiva call. I saw Levi there, offered some comforting words and inquired as to how he was doing. His response blew me away. I still remember until today where I was and what he said to me that night. “We don’t ask questions. G-d has a plan. We must accept it.” Levi’s father had passed a week ago. Now he was mourning the death of his uncle, yet, such faith? How could a man be so devoted? But that exactly who Levi was! He was a devoted man. Devoted to G-d. Devoted to his Rebbe. Devoted to his wife Miriam and four beautiful children, Chaya, Mirel, Mendel and Zalman. Devoted to his Chabad House and Tysons Corner Jewish Community. Devoted to making this world a better place! In 2007, Levi was diagnosed with cancer. What a blow to his young family and growing community. But Levi did not allow this to deter him. The doctors gave him a couple months at best, but Levi vowed to fight! In the Parsha this week, Parshat VaYishlach, Yaakov (Jacob) prepares to meet his brother. Yaakov and Esav are not getting along and Jacob practices three methods of protection to look after himself and his family. First he tries to reconcile then he prepares for battle. After all is set and ready to go, Yaakov turns to G-d and prays. Levi did the same. Levi listened to his team of doctors and made certain to understand what he was up against. Then he prepared to stare his illness in the eye and chase it out. Levi’s prayers and the prayers of others pushed the disease back and allowed Levi to continue his fight forward. Levi was strong and committed. And his faith in G-d and Torah allowed him to survive for several years longer than the doctors predicted. Levi’s stubborn conviction gave him the will to keep going. Levi’s humor, intellect and vigor never let up even though he was becoming weaker and sicker. Levi did not allow it! In May of this year, an unthinkable tragedy hit Levi’s family when their youngest, Nosson, was killed in a boating accident. Levi was frail and ill, yet made the trip to New York for the funeral and Shiva. I went to visit the family at their home. Amongst many visitors, I shuffled in quietly not knowing what to do or say. Its moments like these that we are thankful for lack of practice. The mood was somber and the home mostly quiet, except from one corner of the room came a laugh. I peered to see who it was and noticed Levi. I approached only to find him “comforting” the comforters. What a moment that was to see, Levi, as sick as he was, did not want others to feel uncomfortable around him because of the situation. He immediately broke the ice. Inspiring. In Levi’s merit, in the last couple of months, vigorous prayer campaigns set out to beseech the Almighty to grant Levi a speedy recovery and the mercy he needed. School children, business people, family, friends and complete strangers came together to pray for Rabbi Levi Deitsch. Yet, on Shabbat, Parshat VaYeitzei, Levi was taken from this world and returned to his creator. So young . So energetic. So full of life. Now gone. For me it was hard to imagine and comprehend. It didn’t make sense for someone so full of life to be taken from it so young. In moments like these I tend to turn to the book, Hayom Yom, a compilation of small Chassidic thoughts for each day. The thought for the day of Levi’s passing struck me. Levi’s soul has returned to its creator and he has physically left this world. Levi’s work down below has been accomplished and it was his time to move on. While we cannot even begin to understand it, we try our best to accept that G-d has a grand plan, like Levi so fervently believed! While Levi’s physical work here is done, his mission and agenda will continue. Levi will continue to live on in those who knew him and loved him. Levi cannot be forgotten, he won’t allow it. Levi, you were a dear friend and I will miss you greatly! I yearn for the coming of Moshiach when I will be able to see your cheerful smile and hear your joyous laugh once again. May the Ribono Shel Olam grant comfort upon your family and look over those who you left behind. Levi, the world is darker without you, but is brightened by the light created from having you. Even if it was for just 34 short years.